During the 1800s, the United States expanded westward, across the Mississippi River and eventually to the Pacific Ocean. These western lands, already inhabited for centuries, were purchased, won, and seized outright from Indian tribes and other nations. As migrants came in search of wealth and better opportunities, they encountered and often clashed with Mexicans and Indians seeking to defend their homelands and traditional ways of life. These artifacts evoke the challenges that western expansion presented to those on both sides of the frontier. From 1804 to 1806, Meriwether Lewis and William Clark led an expedition through the Louisiana Purchase, the western territory acquired from France in 1803. 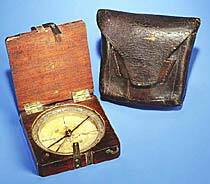 Lewis purchased this pocket compass for the expedition. Lewis and Clark’s mission, assigned by President Thomas Jefferson, was to assess the land’s resources, make diplomatic contact with Indians, and search for the fabled Northwest Passage, a water route to the Pacific Ocean. The party numbered more than thirty and included two French Canadian fur traders and a young Shoshone woman, Sacagawea, who served as guides and interpreters. On January 24, 1848, James Marshall found this tiny piece of yellow metal in the tailrace of John Sutter’s sawmill in Coloma, California. When he hammered the nugget to test its malleability, it proved to be pure gold. News of Marshall’s discovery triggered one of the largest gold rushes in history. Drawing fortune-seekers from across the country and around the world, the gold rush hastened California’s admission to statehood in 1850 and accelerated the cultural, environmental, and economic transformation of the American West. The inscriptions on this pistol, in English and Cherokee, identify it as the work of Salola, a blacksmith for the Oconaluftee Cherokee of western North Carolina. In 1838, 16,000 Cherokee were forced west to Oklahoma on the brutal “trail of tears” after refusing to relinquish lands in Georgia, where gold was discovered in 1829. Salola’s people were among a small number of Cherokee, known today as the Eastern Band, who avoided removal and secured the right to remain in their homeland. Made of California gold, this rare coin was one of the first produced at the U.S. Mint branch in San Francisco. The mintmark, “S,” is stamped on the reverse. California gold initially had to be shipped to the U.S. Mint in Philadelphia, an expensive, slow, and risky undertaking. Meanwhile, private mints made coins that could be used in local markets. With the opening of the San Francisco Mint in 1854, gold could be converted quickly and efficiently into U.S. legal tender.